Lets speak for all those who can't, impaired driving kills! Every day was Halloween in my world. That is the amount of time that has passed since Gracie was killed – yes, I used the k-word. It was not an accident. Once alcohol is involved, it is no longer an accident…it is a crash…it is a choice…it is a crime…it is not an accident. These numbers represent lost hugs and kisses, missed bedtime stories, missed stories about her day…her first boyfriend…her first kiss…her Grade 8 graduation….her first day of high school, missed laughter, vacations, missed birthdays, missed Christmases, missed Halloweens. These times represent each breath that I have taken since Grace died. These times represent each time that I have curled up into a ball in bed or pulled off to the side of the road and cried until I had nothing left. These times represent the “family events” that we fake our way through with our now incomplete family. They represent sleepless nights. Here are some other numbers for you. Since Grace was killed, 5480 more people have been killed by Impaired Drivers in Canada (as compared to approximately 1750 that have been victims of all other forms of Homicide combined). 197,280 have been injured by Impaired Drivers in Canada. Somewhere between 75 BILLION dollars and 249BILLION dollars (depending on source) have been spent cleaning up after Impaired Drivers. 40% of Motor Vehicle Collisions in Canada involve alcohol (World Health Organization and Insurance Bureau of Canada). Canada has the highest rate of Impaired Driving of all of the more developed countries (World Health Organization, MADD). We are one of only a very few countries with a Blood Alcohol Level still at the .08mg (World Health Organization). Of all of the cases where an Impaired Driver is involved in a crash and a death occurs, only 22% are actually charged with Impaired Driving Causing Death. Only 50% of those are convicted of that crime (most plead down). Only 11% receive a jail sentence (that works out to 12 jail sentences for every 500 cases of Impaired Driving Causing Death). In our case, the driver pled guilty to Over .08mg. He was given a $1250.00 fine and a 1 year licence suspension. That is what an 11 year old child’s life is worth in our courts. Yesterday I asked all of you to recognize Gracie’s Life Legacy by registering for Organ Donation. Today I am asking you recognize her Fighting Injustice legacy by logging onto the Families for Justice website and printing a copy of the petition. Then please sign it and ask your friends and families as well and send them into the same address as The Empty Shoe Project on our About Us page. The petition is asking for changes to be made to the law to close up some of the loopholes (loopholes big enough to drive a Ford F-150 through). It is also asking for Mandatory Minimums. We are not asking a lot. We are simply asking for the penalty to be consistent and to send a slightly stronger message. It is devastating enough to have your child die. It is devastating enough to have your child killed. It is too devastating to then be beaten down by the Criminal Court System when you were a victim of someone else’s crime. The members of Families for Justice have already lived these numbers. We have already lived this pain. We are fighting so that you do not have to be dragged into this dark place with us. 80% of Canadians rank Impaired Driving as a problem that needs addressing. I guess that if you are reading this, you are probably one of the 80% so, please, take the 5 minutes that it will take to print off the petition (the link is on our Home page down the right side), sign it, pass it around the office to be signed, put it into an envelope, address it, put a stamp on it and mail it back to me. Yesterday, I asked you to take 5 minutes to register as an Organ Donor and potentially save 8 lives. Today, I am asking you to take that same 5 minutes and potentially save thousands. I am sitting at my kitchen island at 2am trying to decide if I should post this or not. 3 years ago today I finally started to truly come out of my coma. I had started to wake up and have conversations but October 29, 2010 is my first day of any memories after the crash. It is a day that will forever be burned into my memory. Gracie’s doctor came into the room. I’m sure that I had met her before but I didn’t remember her. She explained Gracie’s condition and told us that she would never recover at all. The only thing keeping her breathing was the ventilator and before much longer, her organs would slowly start to fail. Because we had lost our dear France-Anne the year before (FA was more than a neighbour. She was my other daughter. She was my girls’ big sister. She was another bright light in our lives), Gracie was very aware of Organ Donation and she had said multiple times that as soon as she got her licence she was going to sign it to be an organ donor. We knew that Gracie would want someone else to have a chance at the life she wasn’t going to get so we made the most difficult decision anyone should ever have to make. We chose the date to have her removed from life-support – October 31, 2013- Halloween, her favourite holiday. We didn’t know that at the time, we just said Sunday. We had no idea what the date was. (she would be making plans for her costume the next year starting November first). On Sunday October 31, 2010 the nurses at McMaster Hospital back boarded me into Gracie’s bed so that I could hold her one last time. Her family and friends had a chance to come in and say good-bye. Then at around 10pm (not sure of the time, it wasn’t really what I was thinking about) they took us downstairs to a room and removed her breathing tube, her lungs stopped moving, her lips turned blue and her heart stopped beating. Like I said, I really debated about posting this or about making it even less graphic than I already made it but the fact of the matter is that every day in this country, this scene is replayed by yet another family. Maybe it’s time for people to realize how raw and painful it is. I am telling you this because this is Gracie’s legacy. She changed at least 8 lives that day. This is what I want people to know about Gracie. Every day that she was alive she changed someone’s life. That’s just who she was. And she would expect me to end this blog by telling you all to register to be Organ Donors. The two easiest things that you can do to save lives – don’t Drink And Drive and register to be an Organ Donor. Do it for Gracie. Make that her legacy. There have been a lot of discussions about RBT vs SBT in Canada (Random Breath Test and Selective Breath Testing) – Random Breath Testing means that during a RIDE type program where they are stopping cars to check for Impaired Drivers, each driver would perform a breathalyzer test instead of just the ones that the police suspect are Drunk. This is what is predominantly used in every other country in the world, especially the ones that have made HUGE drops in Impaired Driving rates. The one argument that keeps coming up is, “it’s against their charter rights”. First, it’s not. The Canadian Supreme Court has quashed that argument more than once. Second, what about my daughter’s charter rights (and the other rights of our children that are killed by drunk drivers)? What about the charter rights of the 6, yes 6 (up from 4), people killed by Impaired Drivers every day in this country? What about the Charter Rights of the 185 people injured by Impaired Drivers every day in this country? What about the Charter Rights of every other Canadian that is a moving target for Impaired Drivers? I would like to know who decided that the Charter is there to protect the criminals while they are clearly committing the crime instead of protecting our right to live. What about my Charter Right to be able to kiss my daughter goodnight tonight? No, I’m not getting lazy about the blogs….someone pointed out that maybe on the weekends I should re-post some old information so that new people don’t have to go through all of them again. Tell me if you think it’s a good idea or not. I really do appreciate feedback. No, I haven’t switched to a cooking blog. So, how do you eat an elephant? One bite at a time. I used to say that to Gracie all the time. She was dyslexic, so I would often find her staring at something that seemed overwhelming trying to figure out where to start. The truth is when it’s a problem that big it really doesn’t matter where you start, you just NEED TO START SOMEWHERE. Impaired Driving is the elephant in Canada. It is such an overwhelming problem and obviously we won’t agree on everything so why can’t we just agree to start making changes to the things that we can agree on. Why does it have to be all or nothing? Has anybody ever tried to get a large group agreeing on a restaurant and out the door? It’s nearly impossible but sometimes if someone starts the ball rolling with suggestions you can get a consensus. Maybe we can’t agree on what the BAC should be, or the fine, or the sentence – jail, no jail, length of time, fine,etc… We agree that too many people are driving drunk, we agree that too many people are being killed by drunk drivers, we agree that our drunk driving laws as they stand are not being enforced. There’s our start. So, do you start eating an elephant at the head, the middle or the tail end? Well, considering that we are talking about drunk drivers, – the tail end may seem the most appropriate – but the truth is it really doesn’t matter. It seems like all that I have heard about the last couple of years is concussions in hockey players and “poor Sidney Crosby”. Well, here’s my response to that…the number one cause (by far) of Traumatic Brain Injury (a concussion is a bruise a TBI is scrambled eggs for brains) is still Motor Vehicle Collisions. 40% of Motor Vehicle Collisions in Canada involve alcohol (World Health Organization stat over .08 BAC). Therefore, the number 1 cause of Traumatic Brain Injury is Impaired Drivers. So Sidney…..shake it off. I’m expected to and no one is paying me a Million dollars plus per year to do it. I had a very interesting and informative phone conversation the other day. I am constantly amazed by the people that are trying to get the issue of Impaired Driving taken seriously. I sent off an email to a Professor of Law and almost as soon as I sent it with my phone number, my phone rang. I was telling him about our crash and he was dumbfounded that there were no charges for Impaired Causing Death and Impaired Causing Bodily Harm. So I told him the reasons given to us by the Crown Attorneys. I can’t print what he said – at least not in mixed company. I told him about an organization that I am now working with called Families For Justice and how we are working on mandatory minimum sentences and consistency of charges being laid (only 22% of charges are laid for Impaired Driving Causing Death in cases where they should be laid). The wording of the laws need to be tightened up so that they are not open to “lawyer interpretation” (sorry to all of the good lawyers out there…I know some and you’re not included in that). We also spoke about MADD and he said that when MADD first came into Canada, they were all about punishment but MADD found that a little like trying to “wag the dog” so they focused more on prevention, awareness, Random Breath Testing, and deterrents to Impaired Driving. So, in keeping with the dog analogy I suggested to a friend that MADD can keep on working on the front end of the dog and Families For Justice can focus more on the back end of the dog – after all victims and their families have gotten used to negotiating around assholes. The truth of the matter is that both need to be worked on because the more that I thought about the dog analogy, the more it made sense. Because really it doesn’t matter if the dog’s front legs are broken or if the dog’s back legs are broken…either way the dog is crippled. Unfortunately in Canada, all four legs are broken. There are 1500 members on contract in the NHL. (690 are on the rosters in the NHL). There are roughly 150 coaches in the NHL. There is approximately 300 Training Staff in the NHL. For those of you without a calculator that is 1950 people. Between 1400-2200 people killed by Impaired Drivers each year (between 4-6 per day depending on whose statistics you believe). Just imagine the NHL being wiped out each and every year over and over and over and over again. Why do I believe that that would actually get people’s attention? I am certainly not one of her “political opponents” nor could I care less about her politics but if I still lived in Cambridge, I would have serious issues with her judgement and the fact that she made a choice to break the law and has absolutely no regrets about what she could have done to the woman that she hit. Very clearly, she does not feel that the laws apply to her. According to the blood tests, she had approximately 2 bottles of wine in her and yet she is still holding to the 3 drink defence. Just because you use drink it out of a bottle does not mean that it is only one drink. I do share her opinion of being disappointed but not surprised by the conviction. While you’re reading this please send your thoughts and prayers out to Grande Prairie, Alberta. Today is the second anniversary of the Warrior Football players deaths. They were the 5 boys hit by a Drunk Driver and 4 were killed. By the way, the driver was sentenced on February 28, 2013 and he was granted day parole last week. 8 months for 4 boys lives. Think about that as you read the comments from Councillor Wolf and maybe you can begin to understand what victims of Impaired Drivers deal with every day. 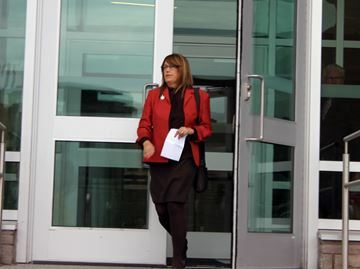 Pam Wolf leaves the courthouse in Kitchener on Thursday. I am disappointed in the decision of the judge but not surprised, given the media attention to my accident. I was advised by legal council to fight the legal charges due to the inconsistencies in the evidence and the procedures in my case. All Canadians are allowed due process and the right to defend themselves before the court. Unfortunately my process has been very public and prolonged. I apologize once again to the driver whose car I scraped, my family, constituents and colleagues. This whole experience has been a wake-up call for me and many others. I hope one of the positive outcomes is the community conversation about consuming any alcohol before driving. No amount of alcohol is safe to drink before driving. I now wish to move forward and focus on serving the people of Cambridge as I have done for the past seven years. Today is Anti-Poverty Day and in Cambridge our Self-Help Food Bank is feeding 1,800 people each month. My husband and I have been longtime supporters of the food bank and I encourage everyone to make a donation to the food bank so that we can meet this need. KITCHENER – A judge dismissed an impaired driving charge against Cambridge Coun. Pam Wolf on Thursday, but found that she “created an inherent risk of danger” being in the care and control of her car while having more than the legal limit of alcohol in her system. Superior Court Justice John Lynch used case law to support his ruling – that a person can pose a risk of danger, even if they aren’t driving inebriated. Wolf was charged with impaired driving and operating a vehicle with more than 80 mgs of alcohol in 100 mls of blood last November, following a two-car collision near Breslau. There was minor damage to both vehicles and no injuries to either driver. During her trial, held in August, Wolf’s defence argued that police didn’t conduct a breathalyzer test within the time reasonably practicable – two hours from the time of her collision. However, Lynch found that breath samples were taken as soon as possible and within the proper timeframe from when officers found her behind the wheel of her vehicle, lending credence to the over 80 charge. Wolf blew a reading in excess of 90 mgs, almost three hours after the collision. Lynch said that evidence of Wolf’s attempts to deal with the collision and pay for damages without the involvement of police pointed to the potential of continued motor vehicle operation. However, he said the Crown did not establish a case for impaired driving. He cited police officers’ observations of a little slurring, a bit of hesitation and slightly glossy eyes, but no corroborating evidence of an unsteady walk, which could have been attributed to Wolf wearing high heels in a gravel parking lot. Wolf was on her way home from an awards ceremony in Kitchener at the time of the crash. She admitted during her testimony to having a couple glasses of wine at the ceremony, where she handed out an award on behalf of the city. On her way home, the roads were slick due to wet weather. Wolf testified that her car tires needed replacing and that her eyeglass prescription needed to be renewed, as she’d been having difficulties with depth perception. Lynch acknowledged that Wolf probably took a turn at too high of a speed, but also said the driver of the other car involved in the collision saw nothing peculiar about Wolf’s behaviour, and that the onus for impairment must relate to the ability to operate a motor vehicle, and must be proven beyond a reasonable doubt. Following Lynch’s ruling, Wolf told the court she takes the charges against her seriously and apologized for her actions, adding that she will continue to abstain from drinking and driving. Lynch ordered Wolf to pay a $1,000 fine, plus a surcharge of $150, and banned her from driving for a year. Outside the courthouse, Wolf told members of the media that the possibility of appeal is something that still needs to be discussed. She said she hopes the positive that comes out of her case is that people realize how easy it is to be charged. The Ward 5 councillor said the entire ordeal has been a long and drawn out process and that her political opponents have definitely done their best to keep it alive. Whether she decides to run for office again is a decision to be made closer to elections, she said. “I’m sure it’s damaged my reputation and so I’ll be working that much harder to regain the trust and confidence of my constituents,” she told the Times. It’s been 3 years since I’ve heard my baby’s voice because one man chose to drink, get hammered and drive home at speeds well in excess of the 80km/hr speed limit. He was so drunk that he never even took his foot off of the gas pedal – there were no brake marks. 3 years that I have missed her voice, her touch, her smell. 3 years that I have cried every day and cried myself to sleep every night – on the nights that I even managed to sleep. 3 years of watching what’s left of my family suffer and slowly fall apart. 3 years of people telling me that it was an accident (no it was a crime). 3 years of politicians lying to us that things are getting better (they’re getting worse). 3 years of politicians saying that they are going to be tough on crime (we’re still waiting). 3 years of being told that “violent crime” rates are dropping (I think that plowing into the side of a car and breaking 20+ bones in a child’s body and causing injuries that lead to her death would be considered a violent crime). 3 years of dealing with insurance companies that treat everyone as if they are committing fraud. 3 years of feeling like everyone just doesn’t get it. 5480 people have been killed by IMPAIRED DRIVERS since Gracie (most stats are 4-6 innocent victims per day). 1096 were children under 16 (most stats average about 21%). 3 years without my baby girl. Look at the people that you love most in the world and imagine a lifetime without them. Which one are you willing to sacrifice to an Impaired Driver? It’s really pathetic when a town in Ireland, a country known for its drinking (I can say that being of Irish descent) legalized Drunk Driving in county. What is this world coming to, right? Do you want to know what’s even more sad??? ?…..Their “drunk driving” standard is still lower than our legal standard. That’s right. The “special exception” that they made is that in County Kerry older citizens that are not used to the new laws can drive with a BAC up to .07. For everyone else it is .05BAC. In Canada, it is legal to drive up to .08BAC. We have not just become apathetic about Drunk Driving…we have become pathetic about enforcing the laws regarding Drunk driving. When you read the article that follows, just substitute Canada for the U.S.
Irish Town That ‘Legalized’ Drunk Driving Still Has Stricter Blood-Alcohol Limits Than The U.S.
One local government in southwest Ireland voted in January to allow certain people living in isolated areas to drive after a few drinks. The measure was proposed by local politician Danny Healy-Rae, who argued that older rural residents were not likely to cause traffic accidents on little-used country roads, and that getting out to the pub could help prevent mental illness, according to the Guardian. Healy-Rae also owns a pub in the county, incidentally. Whether or not you think the suggestion that drunk driving is sometimes okay is ridiculous, never mind dangerous, the story does provoke the question: How does the government decide just how many drinks is too much to drive? In most countries with laws concerning drunk driving, the standard is set by a person’s blood alcohol content (also called blood alcohol concentration). This corresponds to the percentage of alcohol in a person’s blood. Numerous headlineshave been claiming that County Kerry “legalized drunk driving,” when in fact, the legal limit proposed is lower than the BAC standard in the U.S. The Kerry proposal would allow certain residents to apply for permits that allow them to drive on rural roads with a BAC of up to .07, as opposed to Ireland’s current standard of .05, according to the car news site LeftLane. As of July 2004, all 50 U.S. states and the District of Columbia have criminalized driving with a BAC above .08 percent (the last holdout was Delaware). For decades, many U.S. states set the legal BAC limit for driving somewhere between .10 and .15, but that changed starting in the late 1970s, thanks to pressure from groups like Mothers Against Drunk Driving and scientific studies showing that drinking causes loss of certain critical functions related to driving, even before someone is visibly intoxicated. At .08 BAC, the average person likely isn’t falling down drunk, but probably has slightly impaired vision, hearing and reaction time, among other things. “The risk of being in a crash gradually increases at each BAC level, but rises very rapidly after a driver reaches or exceeds .08 BAC compared to drivers with no alcohol in their blood systems,” National Highway Traffic Safety Administration researchers Delmas Johnson and James Fell wrote in a 1995 report. Johnson and Fell examined the data on alcohol-related car crashes in five U.S. states before and after .08 BAC legislation was enacted. Their analysis showed that lowering the BAC limit to .08 generally reduced driver involvement in alcohol-related fatal crashes, ranging from a 4 percent dip in California to a 40 percent drop in Vermont. Plus, to reach a BAC of .08, an average 170-pound male would have to down more than four drinks within one hour on an empty stomach, while an average 137-pound female would need to take in at least three drinks in an hour on an empty stomach, according to the pair. If that number of drinks seems smaller or larger than you expected, remember that standard drink sizes may be smaller or larger than what you’re served at the bar: for beer, it’s 12 fluid ounces; for wine, it’s five ounces; for hard liquor, it’s 1.5 ounces. “A .08 BAC is not reached with a couple of beers after work or a glass or two of wine with dinner,” Johnson and Fell wrote. To get drunker than the old .05 BAC standard in Kerry, the average Irish farmer would probably have to tuck away more than a couple pints of Guinness. According to one online BAC calculator, an average 180-pound man could put away two pints of Guinness (about 4.2 percent alcohol by volume) within an hour and rack up a BAC of just .038, well under the old standard. Under the new standard, he can drink three pints in an hour and be legally safe to drive.